Nearly all industrial sectors require product follow-ups or permanent marking results on products to reliably meet the traceability requirements, thus utilizing dot peen marking machines. These marking systems including scribing, dot peen marking machines and laser marking systems are as often preferred as permanent marking machines. Dot peen marking machines among the others are the most commonly used models. Electro-mechanical components and software of dot peen marking machines enable marking teams or marking machine operators to manipulate pen-like special tool called peen cartrige assembly kits and mark such permanent codes as 2D Data Matrix, serial numbers on any hard-surfaced workpieces. Alphanumerical, numerical, graphical and 2D data matrix marking results consisting of adjacent successive points made by a dot peen marking machine on surfaces of work pieces are easily visible to the human eye. A dot peen marking machine has a peen-cartrige assembly moving on an X and a Y axis by the help of a special marking software. A dot peen marking machine has a specially designed electromagnetic selenoid valve that regulates either air or magnetic field for running dot peen tools that hit and make consecutive circular dents on materials. Marking software controls these specifically designed selenoid valves at very high frequencies therefore vibrating the peens so many times as to make very close dots on the surfaces of work pieces. Since dot peen marking machines create perminant deep marks, they are mostly preffered in gas, oil pipeline industries, construction industry, agricultural machinery industry, automotive industry. Because of very strict traceability requirements in automotive, aerospace and defense industries, quality assurance officers require dot peen marking machines in their perminant marking procedures . These marking machines consist of manually or automatically adjusted Z axis columns, marking heads, work tables. Marking heads of dot peen marking machines include touch screen or computer requiring control units. These portable dot peen marking machines are particularly preferred for marking heavy work pieces. These hend-held models may get attached to colomns and work tables and may be used for desk top dot peen marking operations of small work pieces. These models are called combi marking systems. These marking machines are integrated directly into the production lines. Integrable Dot Peen Marking Machines differ based on the needs for marking fields and controller types. 1) mark flat, concave, convex, rough surfaces. 2) create deep or superficial marking results. 3) Even after the protective coatings and paints applied after marking procedures, provide comfortable reading. 4) provide peen tools with low exchange periods. 5) mark 5 characters in 1 second. 6) mark as deep as for the marking results to remain for years after years. Percussion intervals of a dot peen marking machine can be set on the marking software and the marking results can be easily read on a countless industrial products from metal, plastic to glass. ESEN KARDESLER Chose Dotpeenator PR94 for Meeting Deep Marking Needs.
" 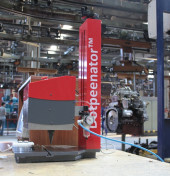 We have been using that Dotpeenator CO9 Dot Peen Marking Machine for 3 years now. We are very much content with the quality of the product and the service of the company. Thanks. " Sarkuysan Elektrolitik Bakir San. Tic. A.S. Question: Is your marking machine suitable for "Low stress stamping (marking)"? However, stress is not any exact value given but changeable. The amount of stress that any similar systems create might be different. And, again since our Dotpeenator is a CNC with controllable depth to some extent, you may drop or increase the value of stress by yourself. 1-You create some intervals between the dots our machine can hit on the surface of the material. Higher the intervals between the dots, lower the stress a peen creates. -Click on "Pen Down Delay" (It is supposed to be 5-8ms) After the first test of the above steps at the value of 5 - 8ms, if not satisfied of the total timing of marking, decrease that value down to 2ms. That procedure decreases the total marking time. Because of that, you may need to increase the air pressure and make the dots twice or more. -Click on "Pen Up Delay" (It is supposed to be any default value between 5- 8ms.) After the first test of the above steps at the value of 5 - 8ms, if not satisfied of the total timing of marking, decrease that value down to 2ms. That decreases the total marking time. Because of that, you may need to increase the air pressure and make the dots twice or more. -Click on the second "Content" in a row from the top on the right side menu. -Make the Intensity: 2 or more as you wish. 2-You shape the tip of the peen like the ballpoint tip of a pen. Higher the radius of the tip of the peen, lower the stress the peen creates.